Use the Winco PECC-24 Green Cover for 2 and 4 Qt. Square Storage Containers to prevent airborne contaminants from settling on your food. 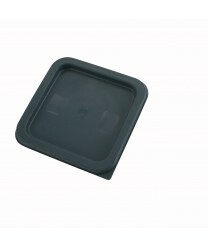 This sturdy container lid is made of polyethylene, so it is lightweight and resistant to cracking and staining. The forest green lid has a convenient corner tab that helps with opening. It is designed for use with Winco 2-quart and 4-quart containers, which are sold separately.